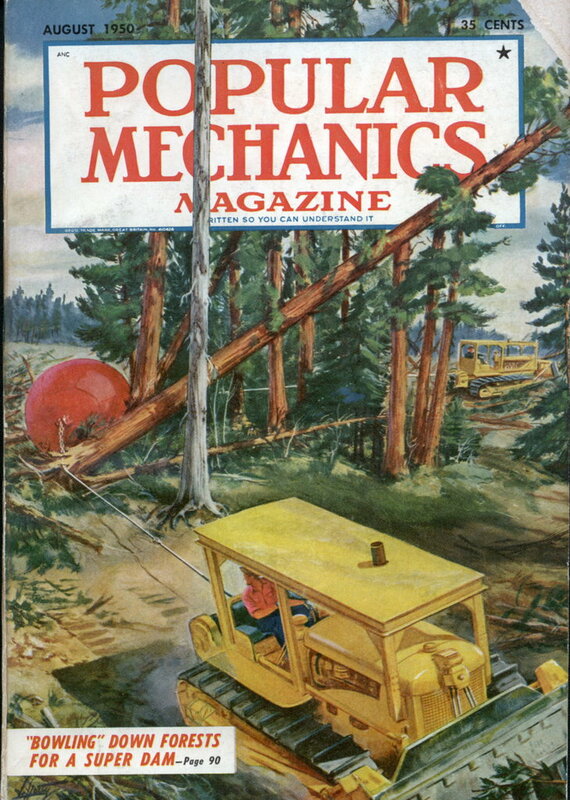 A COPY of Popular Mechanics Magazine that turned up miraculously in a remote mud villageâ€”that was a high spot in our 18 months of captivity by the Chinese Communists. How the magazine got into that part of China I have no idea but it was an old and welcome friend. We read it and reread it from cover to cover. Chief Electrician’s Mate William C. Smith and I were taken prisoner on October 19, 1948, when the light liaison plane I was flying ran out of gas and we had to land on an ocean beach. Ascribe that to a technical malfunction. The gas indicator showed that the tank was almost full even while the engine was turning over for the last time. We sat down only 15 miles north of our home station, the Marine Air Base at Tsingtao on the Shantung peninsula, and we were surrounded at once. That same day we were hustled inland and turned over to a guard unit of the Chinese Communist army. We were held by that unit during our whole captivity while it slowly moved from one village to another. We weren’t treated badly. The Reds kept us under 24-hour guard and in each village we were confined to one hut much of the time, though often we were allowed to wander around the village when accompanied by a sentry. They gave us adequate quilted clothing and we ate as well, or rather as poorly, as everyone else. Our standard diet was dark bread. Now and then when word of another victory over the Nationalists reached the village we all got a luxury meal of fish and rice. Even the best food was extremely poor by American standards. Our chief troubles were worries about what was going to happen to us, and the fact that we had nothing to do. We didn’t know if the United States was even aware that we had been captured. We received no news at all, month after month, and we began to think that everyone except our families had forgotten us. The Chinese smoke a rough, uncured leaf tobacco and Smitty had been allowed to keep his pocket knife. We used up one week carving pipes for ourselves. We got hold of a block of reddish-brown wood and from it Smitty shaped a pipe with a curved stem and I carved myself a pipe with a flat stem, in two pieces and ornamented with a round brass band that originally may have been part of an electric fixture. It’s a good pipe and I still have it. We learned to speak a little Chinese and we spent a lot of time talking with Lieutenant Ho, one of the guard commanders who spoke fluent English. We became pretty good friends. Ho did his best to convert us to the Communist cause but we had one argument that he couldn’t beat. If the American system is so poor, we asked him, why is the average American the envy of the rest of the world? For myself I’d hate to trade life in America for existence in a primitive Chinese village. Now and then in one of the villages a couple of old magazines printed in English would be located and brought to us. We’d spend a day looking them over. Mostly they were English editions of Chinese magazines that probably had been printed in Shanghai. 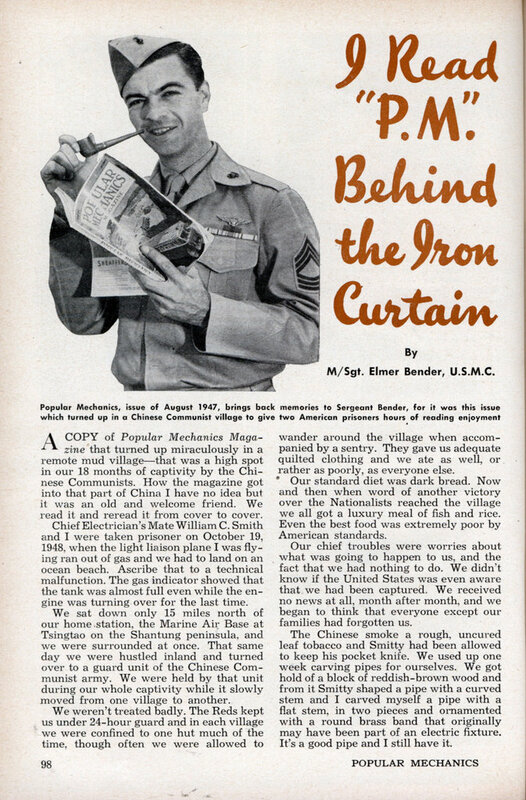 Then one day Lieutenant Ho came into our hut with a smile on his face and a copy of Popular Mechanics in his hands. He’d found it somewhere and he knew we’d like to read it. He’d enjoyed it himself, he said. It was the August 1947 issue, less than two years old. and we got a lot of enjoyable hours out of it. An article on the fine points of how to use a soldering iron interested me, as did a short description of the B-36 bomber. Smitty enjoyed the camera articles and the one on the sub-zero military testing laboratory in Florida. In the Sea-bees he had done some winterization work on electrical equipment. We both learned something from an article on weight-lifting, a kind of exercise we hadn’t tried before. From then on we practiced lifts with a stone grain grinder that the villagers used. It weighed possibly 50 pounds. The Chinese, incidentally, are great weight-lifters. Vehicles of any kind are scarce, so if something has to be moved it goes up on a man’s back or at the ends of a pole that is slung across his shoulders. I saw one man staggering along with a good 500 pounds on his back. Three months ago Smitty and I were beginning to think that we’d have to spend the rest of our lives in China. Nothing was happening and our guards acted as if they had taken on a lifetime job. Then, suddenly in May, we were taken down to the coast and released. The Navy flew us home. I don’t think that captors ordinarily ask favors of their prisoners, yet Lieutenant Ho had one request that he made just as we were departing. It would be a big favor, he said, if we could find a way after we got back to the United States to forward him some more copies of Popular Mechanics!